In a large bowl combine the all-purpose flour, whole wheat flour, baking powder, salt and cocoa powder. Whisk all the ingredients to combine. Add coconut oil, agave nectar and warm water to the bowl of dry ingredients. Mix the ingredients together with a wooden spoon until a large ball of dough forms. Transfer the ball of dough to a floured work surface and knead the dough for five minutes, adding additional flour if the dough becomes too sticky to handle. Cut the ball of dough in half and roll both pieces back into a ball. Continue to cut the balls of dough in half until you have 16 even pieces. Let the dough rest for 10 minutes. Transfer one ball of dough to a floured work surface and roll the dough into a circle that is one- quarter inch thick and about five inches in diameter. Heat a cast-iron skillet over medium heat. Do not add oil to the pan because the tortillas need to be cooked on a dry surface. Once the skillet is hot, add the rolled out dough and cook for 30 seconds. Flip the tortilla and cook for an additional 30 seconds. Repeat until all of the dough has been used and you have 16 cooked tortillas. Transfer the tortillas to a plate lined with a damp paper towel. Wash all the fruit for the fruit salad. Measure blueberries, chop strawberries, peel and dice kiwis, dice mango, remove the seeds from papaya and peel the skin. Dice the papaya into bite-sized pieces and place all of the fruit in a dish. Drizzle the fruit with the juice of the lime. To serve, place one chocolate tortilla on a serving plate. 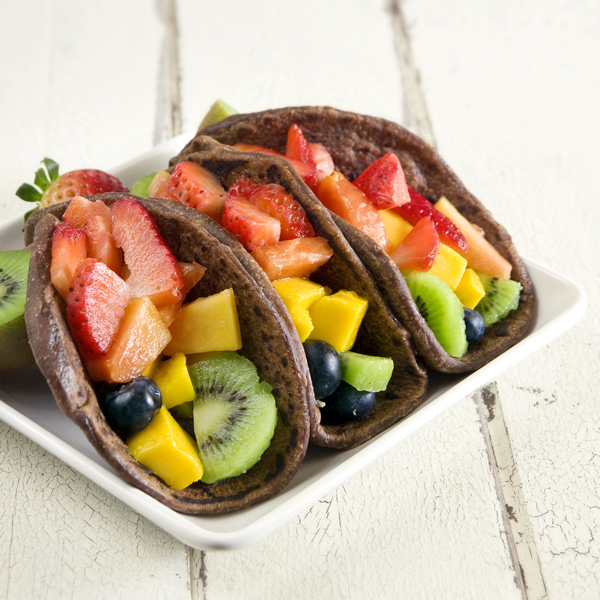 Add a handful of blueberries, several pieces of diced kiwi, a few pieces of chopped mango, several pieces of diced papaya and a handful of strawberries to the center of one chocolate tortilla. Top the fruit with additional toppings of your choice. Chocolate sauce, shredded coconut, fresh mint and honey all work wonderfully.